This donation will allow the project to guarantee its independence, invest in hardware for its build farm, and develop new features to benefit all our users. We will be able to grow the performance and reliability of our existing infrastructure. We also envision better support for new and liberating architectures, and more resilient long-term storage of binaries and source code. It will also allow us to continue our outreach efforts and attract new interns, for example through Outreachy, to further improve and promote the project. The project funds are held by the FSF and spending is overseen by a committee currently consisting of Ricardo Wurmus, Tobias Geerinckx-Rice, and Ludovic Courtès, all core Guix developers. 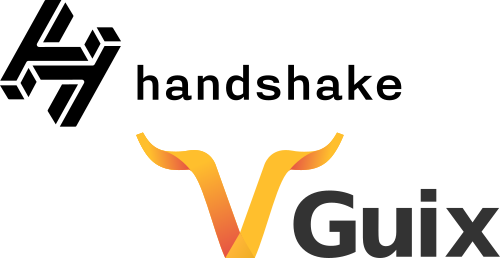 The FSF is the fiscal sponsor of free software efforts, including Guix, as part of its Working Together for Free Software fund. Other recipients include GNU Octave, the GNU Tool Chain, and Replicant. Congratulations to them as well! Above all, a big thank you to Handshake for its support of free software and GNU! The least we could do to show our appreciation was to add a package definition for the Handshake resolver daemon, which we just did. GuixSD can be used on i686, x86_64, ARMv7, and AArch64 machines. It is also possible to use Guix on top of an already installed GNU/Linux system, including on mips64el and aarch64.